Great value 1200 x 450 indirect combination copper tank (48x18 approx inch measurement) height and diameter measurement does not take lagging into account (see below). Complies with current building regulations (Part L), is ERP band C and included in the price is a 2 year guarantee. All connections 1inch BSP for 22mm pipe, except immersion boss which is 2.25inch BSP. Manufactured in West Yorkshire, UK. Suitable for 10m working head. Higher pressure/working head may require a different grade of cylinder which affects cost, please call 0113 871 5 871 or email sales@coppercylinder.co.uk to discuss. Holds 115 litres of hot and 40 litres of cold water. Cylinder includes FlexiLag Insulation - 35mm comes as standard making the overall diameter 520mm. 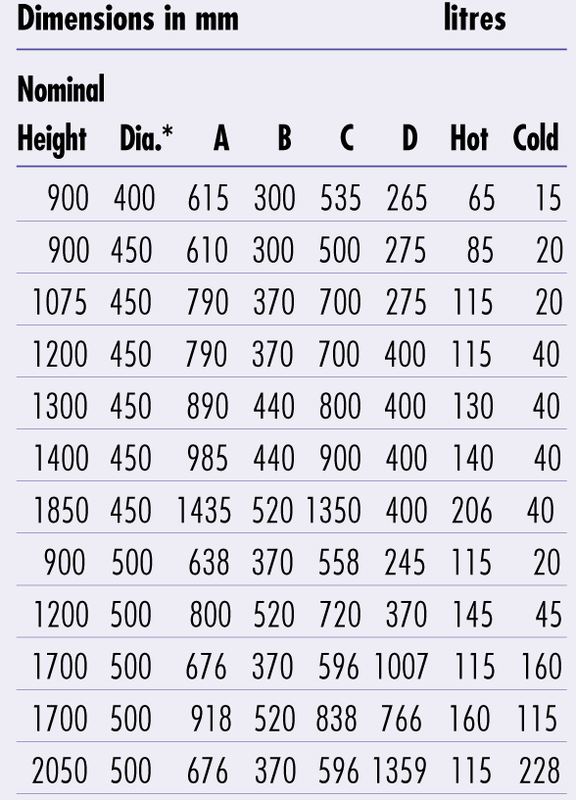 Thicker (50mm) lagging is available on the checklist. Our standard indirect cylinder is not made to be gravity fed, but you can choose for this cylinder to have a gravity coil on the tick list above. Please note, overflow and ball balve fittings are not included with this cylinder. It is possible for us to make holes for the 15mm balve valve and 22mm overflow on request but we need to know where they are on the cylinder so please email over a filled in bespoke cylinder sheet with the order (click here) if this is what you need. Please note: this cylinder is unavailable for return as per our terms and conditions section 4: https://www.coppercylinder.co.uk/terms-conditions/ . 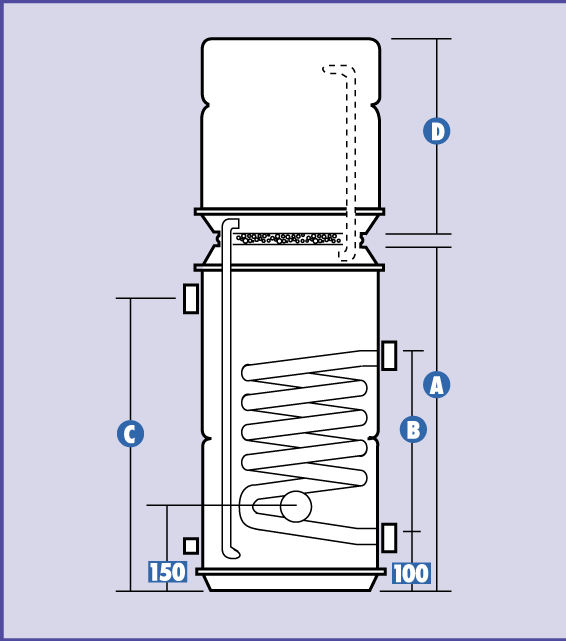 If you’re replacing a hot water cylinder we can make the job a little easier by creating a customised size cylinder and where the location of the connections should be. 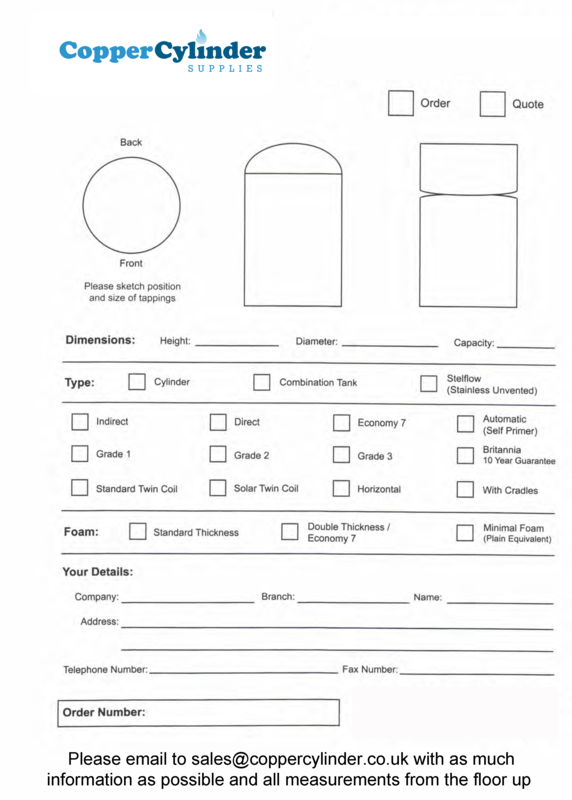 Click here to download our custom cylinder form and mark on as much information as possible. Once this is complete you can email it to sales@coppercylinder.co.uk for a quote. I had my doubts about ordering a cylinder with specific locations for the fittings by mail order but when received I found it exactly as I'd specified; it was made and delivered within three days and all done at a reasonable price.